Apple today announced an update to their iTunes Connect Payments and Financial Reporting website. The new site was re-built from scratch in order to provide developers with an easier gateway to information about their payments. 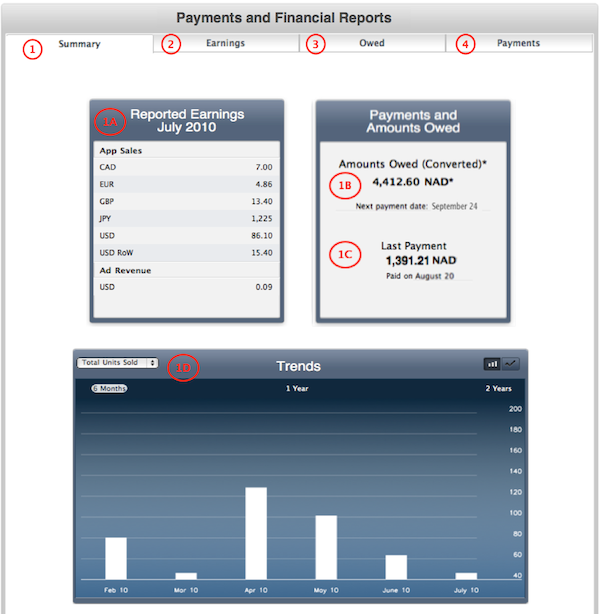 The new interface is what Apple calls a “dashboard” setup and features a cleaner layout with four main tabs: Summary, Earnings, Owed, and Payments. Summary as you can see above provides developers with a full glance at all payment information with large bar and line graphs. The earnings tab provides an in-depth look at payments per region as well as how many units were sold each month per region. The owed tab (surely a fan-favorite) shows how much money you are owed per region and the Payments tab lists which of the financial reports actually get paid to you for a certain month.